Giant Boulder of Death suffers from the 'too free' game problem; It's free, but it's also full of pop-out ads and suspicious redirection to the facebook app. It's too bad, because the game itself is fun, you roll a boulder down a hill, crushing everything, doing so, you accomplish missions, get gold and gems (premium currency, check!) and upgrade your boulder in some capacity. 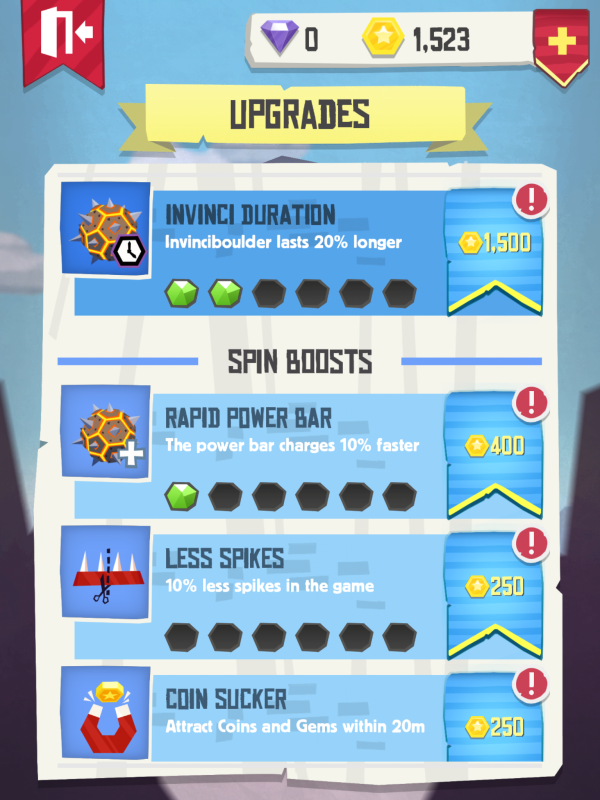 I love upgrades, especially in these 'endless runner (or roller)' type of games. That being said, GBoD offers only three 'permanent' upgrades for your rock, turning better, jumping higher, and longer rampages. The other upgrades only boost a slot machine that you can't play every run (it's once per ten minutes) and that's too bad, the kind of upgrades it offers (faster rampage bar charge, attracting coins, more chances for high-value yetis) should be permanent, they're things that would make the core game better, upgrading a slot machine that I used in maybe 4 runs total doesn't seem like a good use of my coins. What I really loved about GBoD is that when you complete a mission (you only have one at a time), it adds something to the map the next time you roll downhill. At first you have nothing but a few trees but then it adds houses, dogs, soldiers, golden cows, horses, lumberjacks, etc. 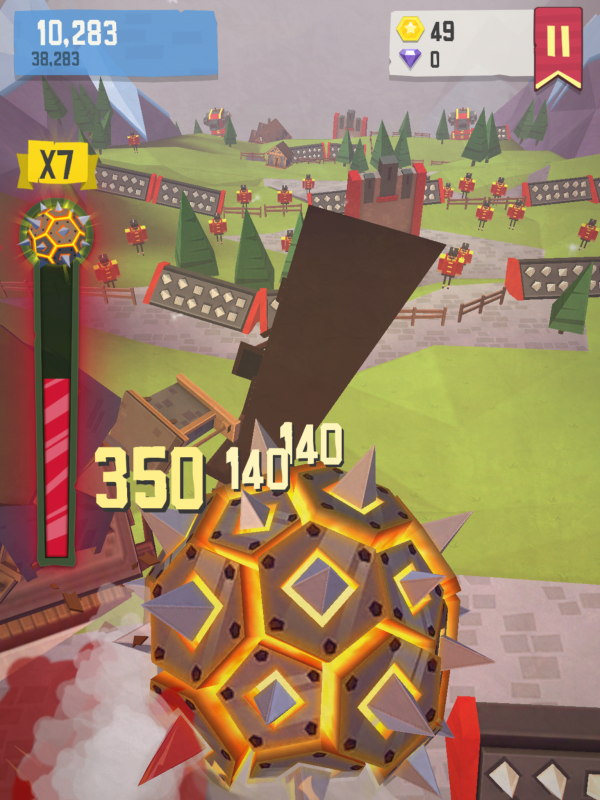 The enemies grow in strength as you get further too, first it's spike traps, then spiked walls, remote mines, tanks. You get more and more score as your multiplier builds up and whenever the rampage bar fills, you turn into a giant spiked boulder of destruction, that's pretty fun. The controls also work very well. But the constant popups about playing some other game or how it won't spam my Facebook wall if I register it, I hate that. Sell your game .99$ and remove the ads, at least. There's some fun to be had with Giant Boulder of Death, simple fun, and since the slot machine only refreshes each 10 minutes, you might not want to play 5-6 runs in a row. You also get gems very slowly, and they're required to skip missions, spin the slots or buyback when you die, all very useful things. That being said, I never felt compelled to buy the coin doubler - because coins are not so useful - nor gems because skipping missions isn't my style.